This image shows light-toned layered deposits along the floor of Becquerel Crater, an impact crater in Arabia Terra. The deposits consist of stacked, repeating layers which consistently appear to be only a few meters thick. The surface of the deposits also appears to be cracked into blocks a meter or so in length. 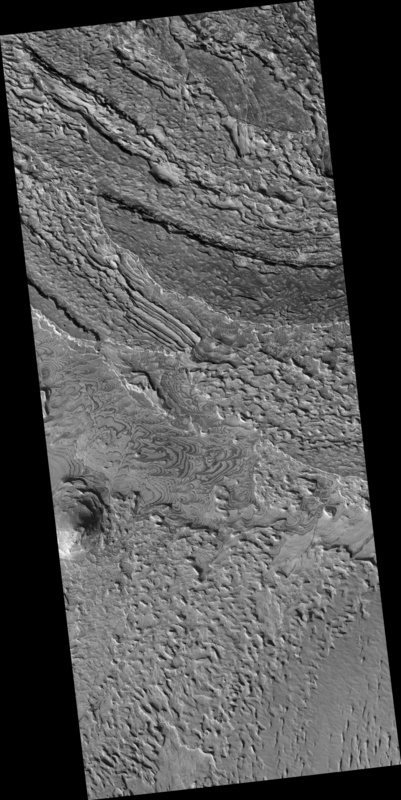 Layered deposits, such as these, form from sediments once deposited within the crater. Possible origins for the sediments include windblown debris, volcanic ash falling from the sky, or sediments that accumulated in a lake on the crater floor. The regular thickness of the layers suggests that they were most likely deposited in a water environment or by wind in a cyclic process. Some of the layering has a dark appearance that produces an alternating bright-dark “zebra” banding. This may be the result of a thin surface layer of coarser and darker basalt sand collected on the more level surfaces, rather than indicating compositional differences in the eroded layered beds. Faults can also be seen displacing portions of the layered bed. 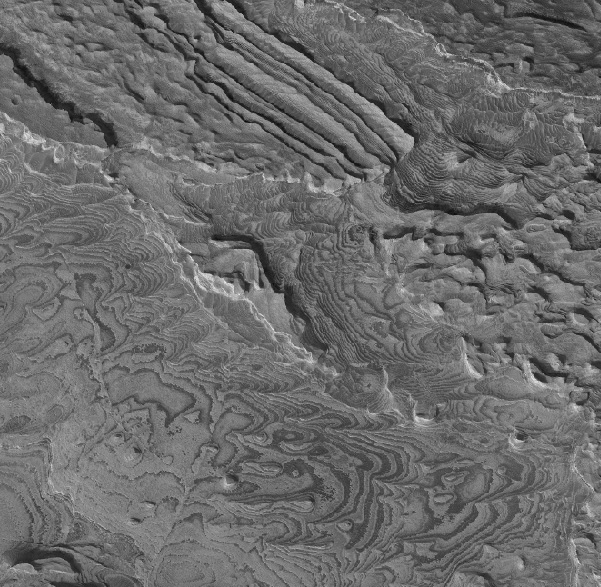 An example of this can be seen just left of center in the bottom half of the subimage. The faulting indicates that the deposits have experienced disruption since their emplacement.